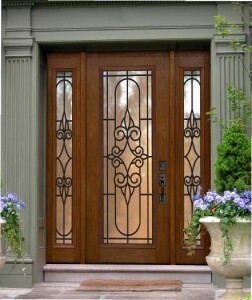 Fiberglass doors are fast becoming an alternative to wood. They offer several advantages over steel, and can be an excellent substitute for areas that receive weather year round. Wood doors don’t hold up well in snow or heavy rain without lots of maintenance. Fiberglass is a good alternative in those situations, especially when you need an exterior door that will last. A fiberglass door offers you great insulation, better than almost any other on the market. Doors can fit whatever r-value you’re seeking, great for areas with a moderate climate. Fiberglass doors are not as expensive as wood, but slightly more expensive than steel. They represent a decent price point for your money. Fiberglass is able to withstand elements well, so it doesn’t require the kind of maintenance other doors might. You can also get a fiberglass door in one of many different kinds of finishes, including faux wood grain. To top it all off, fiberglass is quite secure. Steel is slightly more secure, but you can rest just as easy with a fiberglass front door. Fiberglass doors have a lot of benefits, but there are some down sides. The biggest one is that you’re not getting the quality craftsmanship of a wood door. Faux wood grain finish is definitely not wood. Though you get less maintenance, you don’t get the same value. Most home owners looking to upgrade usually wrestle between buying a fiberglass or wood door. The choice usually comes down to which direction your house faces (towards or away from the sun), and what kind of weather you expect to get year round. Fiberglass is a good alternative for areas with heavy winter storms. Bio: ETO Doors is staffed by professionals in the hardware and interior design industries. ETO Doors reviews are available online, or you can order a door custom-built on the ETO Doors website.